Our Products >> Machinist / Millwright Tools >> DOUGLAS NO. TC258 AUTOMATIC TUBING CUTTER CUTS 1/4" to 2-5/8"
DOUGLAS NO. TC258 AUTOMATIC TUBING CUTTER CUTS 1/4" to 2-5/8"
The Douglas No. 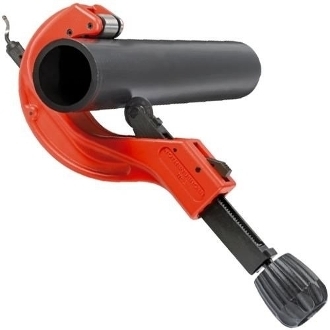 TC-258 Tubing Cutter will cut pipe diameters from 1/4" to 2-5/8". The four roller tracking systems keeps the tube from threading. The full-stop feed systems prevents the wheels and rollers from coming into contact. The wheels are quick and easy to change with only a screwdriver. Cleanly and easily debur pipes with the replaceable machinist's reamer. Ergonomically designed for professional performance.